John Abdo's mission is to help people get healthy from the inside. This program will help those striving for success in any area of their life and to break their goals down into smaller ones and perform the tasks they need then to achieve life's biggest goals. Better Health and Energy = More Productivity = Fun and Success! John Abdo is an expert in weight training, aerobics, polymetrics, fat loss, athletic strength training, health and nutrition. He is the co-host and co-producer of the popular weekly fitness television series Training and Nutrition 2000 which John began in 1985. John is the personal training of choice for legions of athletes, fitness enthusiasts, health seekers and people who what to feel great about themselves. 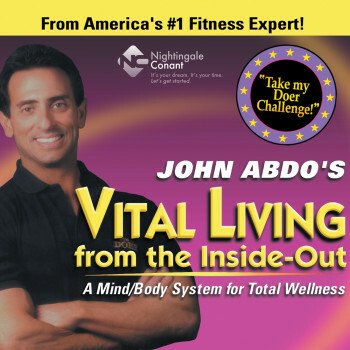 His multitudes of "Doers" (as John's fans are affectionately called) have made John Abdo a household name when it comes to staying in shape the best, safest, simplest way possible. A prolific teacher and writer, John appears regularly on television and radio shows across America. His message promotes health as the basis for obtaining better appearance, enhanced performance and an extended life span. He is the fitness editor of Fitness for Longevity, contributing editor to Muscle & Fitness, and owner of JA Fitness, a consultation and mail-order supplier of instructional videos, exercise equipment and nutritional products. Rewarding yourself for a job well done! John's mission is to help people get healthy from the inside. That includes body, mind and spirit. Health and energy are imperative to live a successful life, not simply just to look good. We need enormous amounts of mental and physical health and energy whether it's building a business, raising a family, pursuing a career, hobby or participating in a sport. John's program will help those striving for success in any area of their life and to break their goals down into smaller ones and perform the tasks they need then to achieve life's biggest goals. When getting healthy is your main objective, you'll concurrently respect your fitness and nutritional needs. You'll gain the ability to enjoy life, even in the midst of a struggle, and be proud that you can meet life's challenges and win. The results for you will be better health and energy, which make you more productive, which will add to your financial independence and help you become successful in all areas of your life!